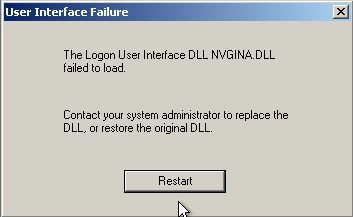 The Logon User Interface DLL NVGINA.DLL failed to load. Contact your system administrator to replace the DLL, or restore the original DLL. With this, only a restart button was shown in the message box. To resolve this, connect to the servers registry from another PC/Server and change the registry key GinaDLL from value NVGINA.DLL to MSGINA.DLL. This key can be found at HKEY_LOCAL_MACHINE\Software\Microsoft\WindowsNT\CurrentVersion\WinLogon. Please make sure the MSGINA.DLL is present in the C:\Windows\System32 folder on the server.